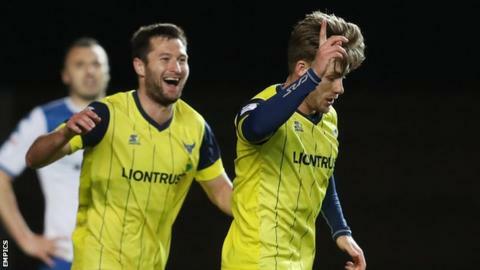 A Conor McAleny hat-trick helped Oxford United maintain their League One play-off hopes in an emphatic win against relegation-threatened Bury. Everton loanee McAleny bagged his second hat-trick of the season for the U's as the hosts dominated throughout. Marvin Johnson's finish and Joe Rothwell's dink came before McAleny strikes either side of the break. James Vaughan headed a consolation for Bury on the hour before McAleny's third goal came deep into injury time. Oxford, who head to Wembley on Sunday to face Coventry City in the EFL Trophy final, move to within four points of the play-offs with six games remaining. Bury are just four points above the relegation places in 17th with five games still to play. Match ends, Oxford United 5, Bury 1. Second Half ends, Oxford United 5, Bury 1. Goal! Oxford United 5, Bury 1. Conor McAleny (Oxford United) right footed shot from the centre of the box to the bottom right corner. Assisted by Antonio Martínez. Foul by Antonio Martínez (Oxford United). Paul Caddis (Bury) wins a free kick on the right wing. Robert Hall (Oxford United) wins a free kick in the attacking half. Foul by Paul Caddis (Bury). Attempt missed. Robert Hall (Oxford United) left footed shot from the centre of the box is just a bit too high. Antonio Martínez (Oxford United) wins a free kick in the attacking half. Foul by Antony Kay (Bury). Attempt missed. Tom Walker (Bury) left footed shot from outside the box is close, but misses to the right from a direct free kick. Cheyenne Dunkley (Oxford United) is shown the yellow card for a bad foul. George Miller (Bury) wins a free kick in the defensive half. Philip Edwards (Oxford United) wins a free kick in the defensive half. Attempt saved. Robert Hall (Oxford United) left footed shot from outside the box is saved in the centre of the goal. Leon Barnett (Bury) wins a free kick in the defensive half. Substitution, Oxford United. Joe Skarz replaces Marvin Johnson. Attempt missed. Liam Sercombe (Oxford United) right footed shot from the centre of the box is just a bit too high. Attempt saved. Liam Sercombe (Oxford United) right footed shot from the centre of the box is saved in the centre of the goal. Foul by Robert Hall (Oxford United). Paul Caddis (Bury) wins a free kick in the defensive half. Jacob Mellis (Bury) is shown the yellow card for a bad foul. Marvin Johnson (Oxford United) wins a free kick on the right wing. Foul by Jacob Mellis (Bury). Attempt missed. Jacob Mellis (Bury) right footed shot from outside the box is high and wide to the right. Attempt saved. Antonio Martínez (Oxford United) right footed shot from the left side of the box is saved in the top centre of the goal. Leon Barnett (Bury) wins a free kick on the left wing. Conor McAleny (Oxford United) wins a free kick on the right wing. Attempt missed. Robert Hall (Oxford United) left footed shot from outside the box misses to the left. Attempt missed. Paul Caddis (Bury) right footed shot from the centre of the box is just a bit too high. Corner, Bury. Conceded by Cheyenne Dunkley. George Miller (Bury) wins a free kick on the right wing. Attempt saved. Conor McAleny (Oxford United) right footed shot from outside the box is saved in the bottom right corner. Delay in match Simon Eastwood (Oxford United) because of an injury.